To refocus on what they hope will be a more profitable future and distract from evidence of major investors' losing faith. WeWork is rebranding as The We Company as the loss-making shared office provider seeks to reassure investors of its future growth potential by ramping up its communal living apartments and schools businesses. Despite the huge valuation, (it) has yet to turn a profit and reported a loss of $723m in the first half of 2018. WeWork’s biggest investor, Japan’s SoftBank, scaled back its planned investment for this year from $16bn (£12.5bn) to $2bn. 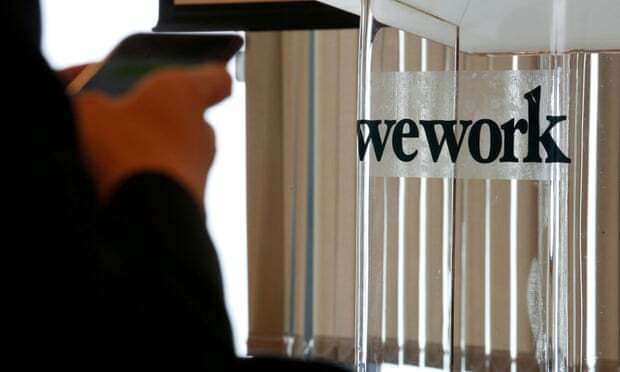 WeWork is rebranding as The We Company as the loss-making shared office provider seeks to reassure investors of its future growth potential by ramping up its communal living apartments and schools businesses. The new brand will encompass three divisions: WeWork, which runs 500 serviced offices across the world; WeLive, its co-living residences; and WeGrow, the education business run by Neumann’s wife, Rebekah. We Company’s other units are in their infancy. There are two WeLive communal living facilities (one in New York, and one in Washington DC). WeGrow operates one Montessori-based school for‎ three-11 year-olds in Chelsea, New York. The company, which has been marketed with the tagline “Do What You Love” and offers its “members” free coffee, grapefruit-infused water and a choice of craft beers, has risen to become London’s biggest office occupier. WeWork has taken space in 42 office buildings in the capital, including eight floors of a block in Moorgate with space for more than 3,000 workers, two buildings in the heart of Soho and an outpost in London Fields, which it has described as the “epicentre of east London’s creative hotbed”. It has also opened an office in Manchester and has plans for another in the city, and has been also scouting for locations in Birmingham, Edinburgh and other UK cities. WeWork owns a small fraction of its real estate, instead renting space from traditional landlords that it breaks into smaller offices and communal shared desks. In spite of having very few physical assets, it has attracted investment from Goldman Sachs and JP Morgan, as well as SoftBank. The Japanese bank’s previous investment in WeWork valued the eight-year-old company at $42bn, making Neumann’s remaining stake worth $2.5bn. WeWork, despite the huge valuation, has yet to turn a profit and reported a loss of $723m in the first half of 2018.